With the rains behind us, for now, a JetBlue takes off from Long Beach Airport with blue skies, snow caped mountains and the Boeing Co. office buildings behind it on a sunny morning. 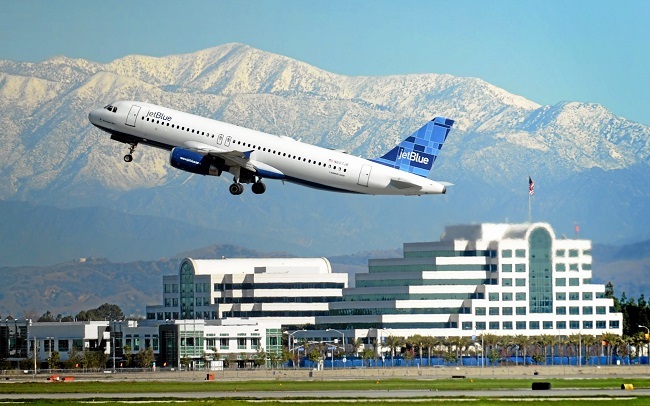 JetBlue on Monday formally requested Long Beach Airport apply for a federal customs facility, a move that would allow international travel at the city-owned airport. In a letter sent to Airport Director Bryant Francis, Robert C. Land, JetBlue senior vice president for Government Affairs and associate general counsel, stated the airline has no interest in modifying the city’s airport noise ordinance. “JetBlue will utilize only its current allotment of assigned Air Carrier slots and existing aircraft parking positions to fly internationally in addition to our current 11 domestic markets,” Land wrote. Adding the customs facility, Land contended, would enhance Long Beach’s stature and improve the local economy through increased tourism, commerce and conventions. “We look forward to working closely with the city to immediately proceed with the application process and begin the work required to secure an international flight designation for the city of Long Beach,” Land said. A JetBlue representative said the company has nothing more to add at this time beyond the contents of the letter. The Long Beach City Council hosted a study session last week on the 20-year-old airport noise ordinance effectively limiting flights to 41 commercial and 25 commuter flights daily. City officials noted the ordinance has never been changed due to “lurking fear” the city could lose its grandfathered exemptions under the Federal Aircraft Compatibility Ordinance of 1990. Since the law’s passage, no other city has been successful in securing noise restrictions as stringent as those regulating aircraft at the Long Beach Airport. On Monday, an airport spokeswoman, Stephanie Montuya-Morisky, confirmed the letter had been received but deferred comment to the City Manager’s office. “We want to be as transparent as possible, and we want the discussion to happen at the City Council level,” Montuya-Morisky said. The bed is made of ice, the walls and floor made of snow, and the ambient temperature is a brisk 24 degrees F. Sound like a place you’d like to spend the night? Surprisingly, many people do. The Hotel de Glace (Ice Hotel), located a few miles from downtown Quebec, is an imaginative creation of snow and ice, reconstructed every winter in a matter of six or so weeks. From the grand entrance, complete with check-in counter, to the guestrooms, the walls of every room are intricately carved into masterpieces of art, and some of the beds feature massive ice canopies and elaborate headboards. The hotel is open for overnight stays and to tourists from Jan. 5 to March 22. With 44 rooms, a vaulted hall with an amazing ice chandelier, chapel, bar, disco, and ice slide, there’s a lot to see. Visitors can walk around on their own or sign up for a tour. We opted for the tour, which included a drink at the ice bar. Like any hotel, the guestrooms range from the small and simple to elaborate suites with fireplaces, which are for ambience only as no heat enters the room. Most rooms come with an ice chair and ice table (can’t imagine spending much time there!) and have one to three beds. But all feature amazing sculpted decor, every one different from the last. This year’s theme is “Space-Time,” and as visitors wander from room to room, they journey from ancient times into the future. On our tour, we saw one room depicting humankind’s space exploration with a relief of the Space Shuttle and a full-height sculpted astronaut, and another showcasing automobiles, complete with an ice car bed. Our guide Sara explained that in the evening, the guestroom areas are closed to the public, cleaned and prepared for those staying overnight. A mattress and an isolating bed sheet are placed on the bed to keep the cold from seeping in, and each person is given an arctic sleeping bag. “We advise guests to take a warm shower before bed to increase the body temperature. This will help you stay warm throughout the night,” she said. 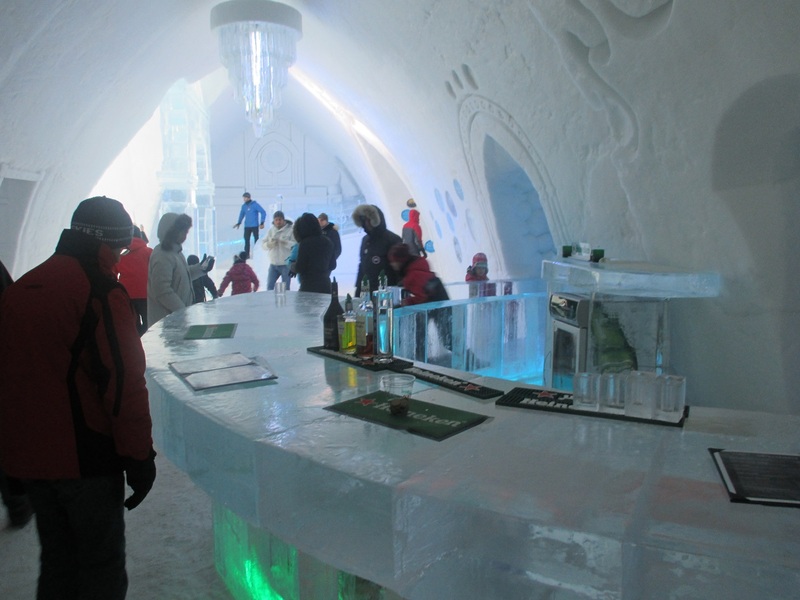 After visiting the entrance hall, several rooms, the chapel and disco, the tour ends at the ice bar – a popular stop apparently from the size of the crowd. Sara explained the beer, wine and alcohol are stored in refrigerators not to keep them cold but to keep them from freezing. Everything from the bar counter to the lounge chairs and tables are made of ice. Even the drinks are served in an ice glass, a bulky square block of ice with a hole in the center to hold the liquid. The first ice hotel went up in 2001, and it’s been a popular winter attraction ever since. With the outside temperature only in the single digits, standing at a table in an ice bar enjoying a vodka and cranberry juice cocktail out of a frozen glass in an ice hotel at 24 degrees feels downright warm. From where we stand near the starting line, we can hear the canoes coming before we see them. We hear the voices of the crew, but mostly we hear the scraping of boats over ice. The ice on the river is broken up in huge blocks, and navigating them takes great physical effort and group coordination. 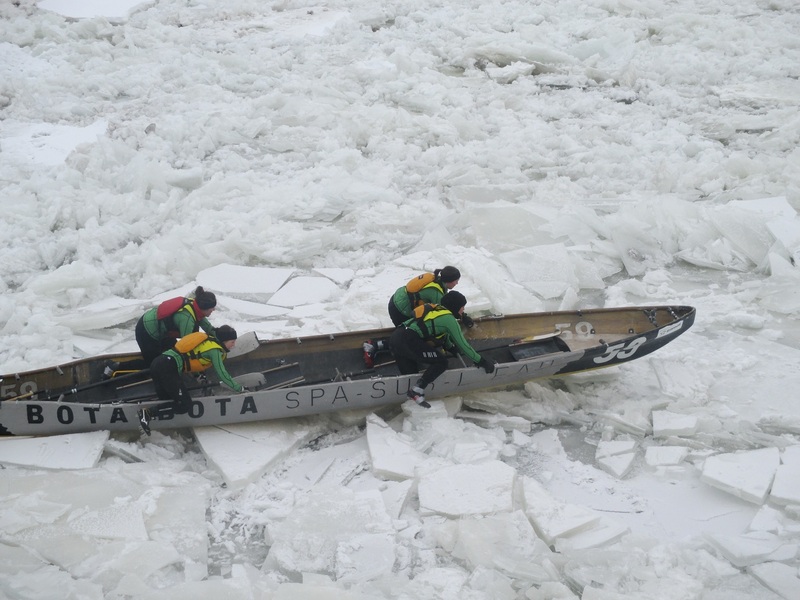 Wearing spiked shoes, holding on to the gunwale, and kneeling on one knee in the boat with the other leg dangling over the edge, the crews propel their canoes up and over the chunks of ice. The crews do this for half a mile up river before reaching flowing water where they jump in and start paddling. For today’s race, the temperature is in the single digits, sinking into sub-zero with the fierce wind blowing across the river. But the cold weather doesn’t keep bundled-up spectators from lining the riverbank, four and five deep. Nor, apparently, does it bother the racers. The ice canoe race is a carnival staple. It’s been held every year since the carnival’s inception in 1955. The first women’s team participated in the race in 1966. 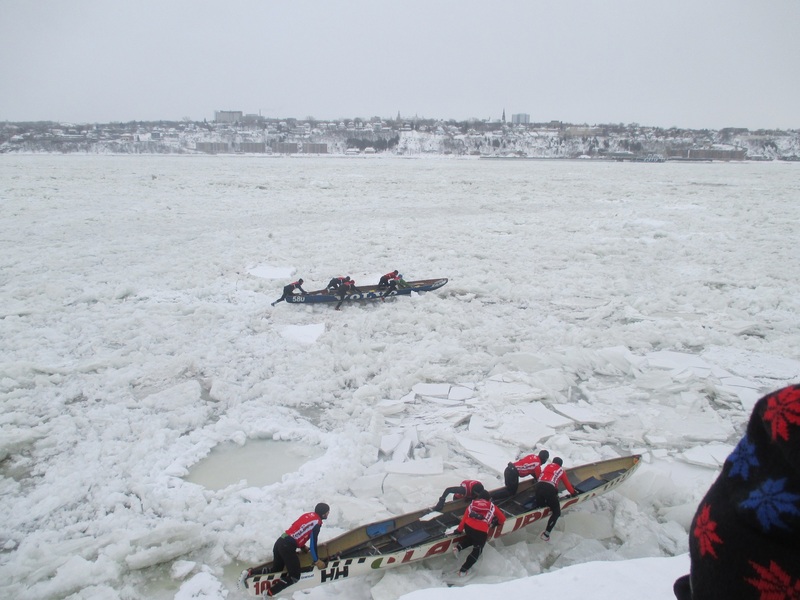 The race begins in Quebec City, and teams navigate a course across the river to Levis and back. The elite male class must complete the circuit twice. So why a canoe race on a frozen river? According to the Quebec City Tourism website, carnival competitions were created to represent Quebec winter traditions. The canoe, dogsled and sleigh are traditional modes of transportation and were important to the settlement and history of Quebec. 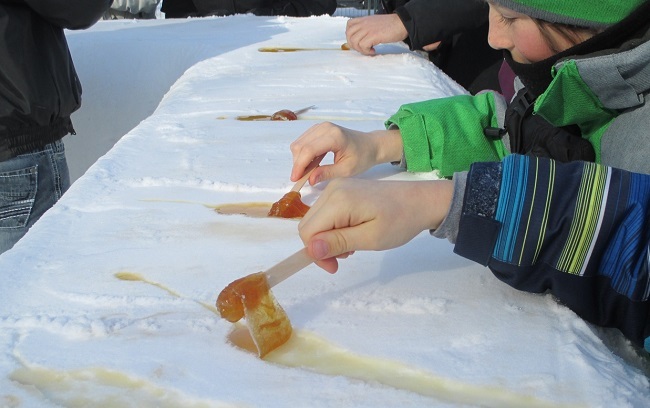 Quebec’s winter carnival ends today with the sleigh races and the closing ceremonies. Lights, camera (yours) and lots of action. That’s the night parade at Quebec’s Winter Carnival, a 17-day long celebration of all things snow and ice. The parade is so popular it’s done twice – once in the suburb of Charlesbourg and a second time through the streets of Quebec. The Charlesbourg parade was held last weekend, and the parade in Quebec is set for Saturday. “The parade in Charlesbourg is held earlier in the night at 6 and is better for children,” said Paule Bergeron of Quebec City Tourism. Standing with the crowd in Charlesbourg, a look across the street at the row of children lining the parade route definitely gives the impression this is a family event. And the zero-degree temperature hasn’t spoiled the fun. But it does make for a lot of stamping of feet, clapping of hands and dancing around by spectators just to stay warm. Even the marching bands had to wrap their instruments to keep them from freezing. 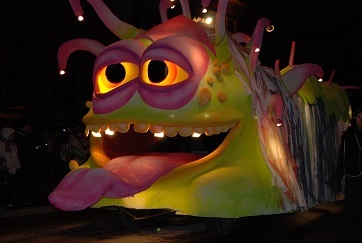 This wide-eyed creature is just one of many in the parade. It’s the colorful lighted floats, however, which are the most interesting. A long procession of sea creatures, magical creatures, and what looked to me like dancing snow wolves entertained the crowd. At the end of the parade came Bonhomme, the carnival’s mascot. Bonhomme is a snowman who wears a red cap, an arrowhead sash and a big smile. And just like with Mickey Mouse at Disneyland, the kids, parents and tourists all clamber for a photo with the famed character. 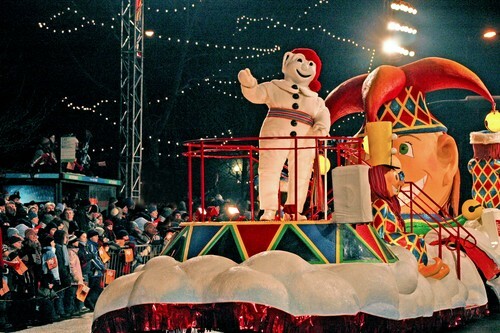 Bonhomme’s been around since the first carnival in 1955, and kids seem to love him. The carnival concludes this weekend with the snow bath (put on your swimsuit, some boots and roll in the snow), Quebec night parade and after-party on Saturday and the sleigh race and closing ceremonies on Sunday. Bonhomme waves to the crowd. Bundled up in several layers of clothing, we braved the single-digit temperatures for a sled ride down an ice track, a round of bumper rafts on ice, a drink of caribou at the ice bar, and a walk through an ice castle. We even made our own “maple-sicles” in the snow. 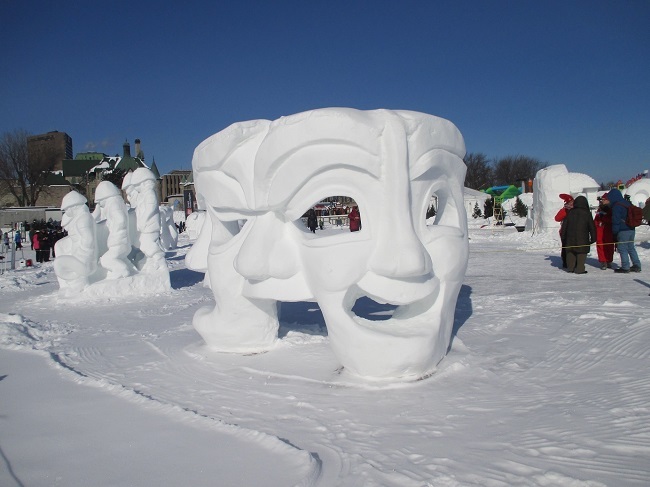 It’s all part of Carnaval de Quebec, a 17-day long celebration of all things snow and ice. Quebec City, like much of the northeast in early February, was in the grip of a deep freeze, but that didn’t keep families from bundling up in their snow gear for some winter fun. The carnival is spread across the Plaines D’Abraham just outside the old walled city. In addition to the rides, food, music, snow sculptures and events at the Plaines, parades, concerts and races take place throughout the city. The first thing you notice – and can’t miss – at the carnival is the large ice palace, a tradition going back to the first carnival in 1955. As you go from room to room, you can lounge in an ice chair, check out the ice bar, and explore ice tunnels (for kids, except for one parent we watched crawl in to retrieve her wayward toddler). Then there are the beautiful to fantastical snow sculptures. The international snow sculpture competition has been part of the carnival since 1973. Sculptors from around the globe come to Quebec to create these intricate and realistic works of art. A trail winds among the sculptures so you can view them from all sides. Being Canadians, of course there’s a small hockey rink, where kids can grab a stick and join in. There’s also ice fishing, dogsled rides, a tubing hill, and bumper rafts, where you just sit back and enjoy the spin as the boats (on wheels) are pushed around the ice. And what’s a carnival without food and drink? We tried the make-your-own maple pop and caribou. 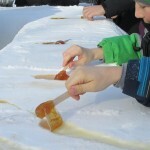 To make a traditional Canadian maple pop, a foot-long strip of warm maple syrup is poured on top of snow, and you take a popsicle stick and roll the slowly hardening syrup around the stick. As for caribou, with a name like that how could we resist? Caribou is made with Canadian port, vodka and brandy and is served warm – perfect on a frigid winter day. The carnival concludes this weekend. Special events include the night parade and after-party, a sleigh race, and the crazy snow bath. Looking for a good time? No, we don’t mean that KIND of good time! 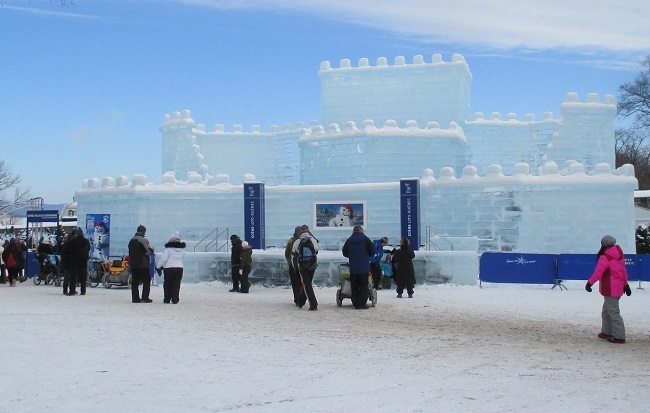 Join us as we travel to historic Quebec City for the fabulous Winter Carnival. We’re thinking French food, French wine and joi de vivre. Maybe we’ll join the parade through the streets tonight, or jump in a canoe for the race across the frozen St. Lawrence. Come check out the ice hotel with its famous ice bar, maybe share a little ice wine. Of course, we’ll be skiing in the local mountains. Have you ever skied Mount St. Anne’s? We’ll even throw in a little history and cultural background.